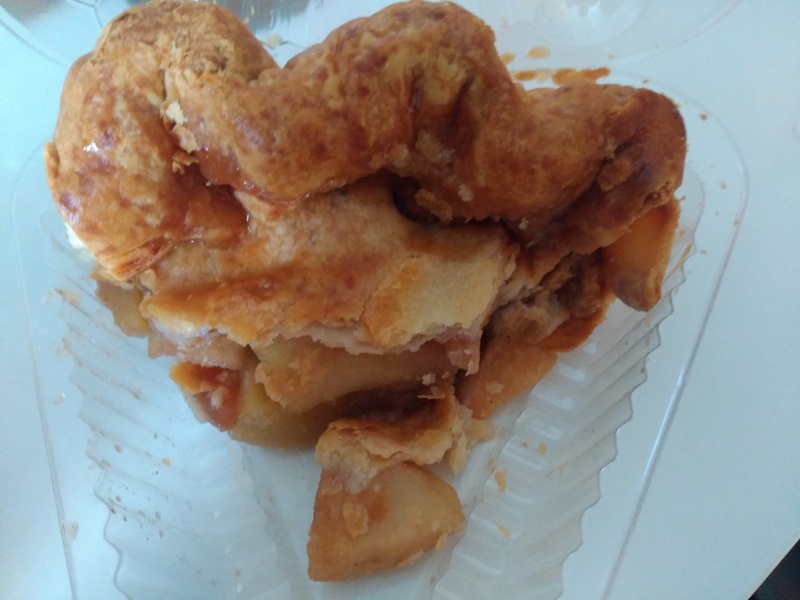 Pierate - Pie Reviews: Who Are Hoosier Mama Pie Company? Who Are Hoosier Mama Pie Company? As part of my Chicago Pie Tour and Pierate's American Pie Season, I paid a visit to Hooiser Mama Pie Company. To start with, I had no idea what Hoosier Mama Pie Company was all about, because I didn't know what the name meant. For a British lad the term 'Hoosier' is a bit of an enigma. My only reference point was the band 'The Hoosiers' with their 'Trick to Life' album. I started wondering if HMPC were trying to say that the 'trick to life' is to eat more pie. After all they do carry the quote "We must have a pie. Stress cannot exist in the prescence of a pie' on their website (I mantra I try and live by and is indeed hung upon my own wall). Upon meeting one of the proprietors, Craig, he explained that Hoosier is a term for a person from the state of Indiana, where he and his wife Paula were from, then I started to understand who Hoosier Mama Pie Company are. Paula is the eponymous Hoosier Mama, conjuring up visions of traditional and homely pies, just what I was looking for in order to get a real taste of America! I visited the Chicago store, which is apparently the original, but smaller, of their two pie shops. It felt tiny inside but I liked it. It was unpretentious, with some decorations explaining the virtue of pie and a few mix and match table and chairs. The small size made me suspect a lot of people are ordering their pies whole, to take away and eat at home. Of course, what excited me the most was the small cabinet proudly displaying their selection of pies. I was again, very pleased that there were pies which met our definition our a pie, being that it should be fully encased in pastry (as this was one of my main concerns for the Chicago Pie Tour). I even more pleased to see that a savoury Chicken Pot Pie was available as I was in the mood for a savoury meal. The pies at Hooiser Mama are mainly large pies. These are sold by the slice to customers who are eating in (although presumably you could try and eat the whole pie there and then, although you would need quite a group as the pies are very large). The Chicken Pot Pie looked great on the shelf with a slice yet to be taken from it. The pastry looked flaky and golden. The arrival of the slice of pie was preceded by a beautiful waft of a buttery, chicken aroma. Sadly, the pie hadn't held together all that well on slicing, which detracted from the appearance somewhat. It is difficult to get a slice of a hot, meat pie to come out looking pretty. Taking a bite, I found that the pie really made up for this in the flavour department! It was full of flavours which were different to your typical British pie. The emphasis here was on a buttery taste to both the filling and the pastry. It was well seasoned and contained peas, carrot and potato as well as the chicken. The chicken seemed like real pieces of chicken, not the processed cubes of breast meat which are found in lesser chicken pies. I enjoyed the firmness of the vegetables which added variety to the texture (although the potato was a bit too firm if anything). The pie was so well filled it was almost lacking in pastry (given that it was slice of pie). Fortunately there was a thick roll of pastry at the back. Often this large crust can be a bad thing, but in this case it was not at all dry and helped give the pie the right balance of filling to pastry. For $6.25 this seemed like a decent sized slice of pie. It was enough to prevent me eating another slice of pie straight away at least! I think the rich, buttery flavour would have also put me off from eating a lot of this pie, a slice was a good amount. Overall a very tasty and stand-out pie, the main thing stopping it getting a higher score was a lack of cohesion causing it to fall apart on serving, not quite what I would be looking for in the ultimate pie. I also had to try a sweet pie so I picked up a piece of their apple pie to take-away. They were good enough to give me a bit extra too which I contemplated bringing back to the UK for the other Pierateers to try. However, it had already become so smashed to pieces by the time I got back to my hotel that I realised this wouldn't be worthwhile! A slice of apple pie costs $5.50 which initially seemed like quite a bit for a slice of fruit pie (a bit over £4). However the slice was really big, bigger than many individual pies and had a premium appearance which you would expect to pay more for. It is better value to buy the whole pie but here I was paying more for the individual slice and the option to eat it on the premise with coffee. When it came to the eating I think it lived up to the price tag. They advertise it as 'not too sweet, with more apple than goo, in a delicious buttery crust' and I think this is a better description of this pie than I could ever have come up with. There was a lot of apple chunks which were soft but retained some bite. The pastry lid and crimp was crispy and had a lovely sugar glaze, this was a sweet treat which I would have been happy to eat on it's own. The rest of the pie was surprisingly moist. There was plenty of gooey syrup which had soaked into the bottom crust, leaving it a bit too soggy in my opinion but tasty nevertheless. (This may have been because I had pursued the take-away option causing the syrup to leak out, I am not sure.) There was plenty of flavour to this pie, it was more spiced than I usually find back in Britain and I really liked the cinnamon hit. For my taste it was quite sweet (as opposed to other apple pies back home with slightly sour hint). This was not over the top but enough that I only wanted to eat one slice at a time as more might have become sickly (perhaps it would have gone well with ice cream). Overall I really enjoyed this apple pie, it was certainly the best apple pie I had during my trip to Chicago and the crunchy part of the pastry was probably the best I have ever had with any sweet pie ever! It was close to beating the Morecambe Apple pie (British Pie Awards Supreme Champion 2014) as my favourite ever apple pie (if cost was not a factor). Both pies deservedly receive 'Pierate Highly Recommended' Awards. I can see why Hooiser Mama have become arguably the biggest name in the Chicago pie scene. The pastry is like no other and it shows that the pies are carefully made on a small scale. Craig explained that were they to produce more pies it would be difficult to maintain oversight of the quality. The small size of the operation was something that I really liked about HMPC and I think the pies would loose something if they were to be produced on a larger scale. Thanks to Paula and Craig for presenting me with my very own Hoosier Mama branded pie slice! Ever time I use it I will remember this true slice of America and I wish them much success in the future.